"Poke it. Poke it with your forefinger. That's how you test its quality." 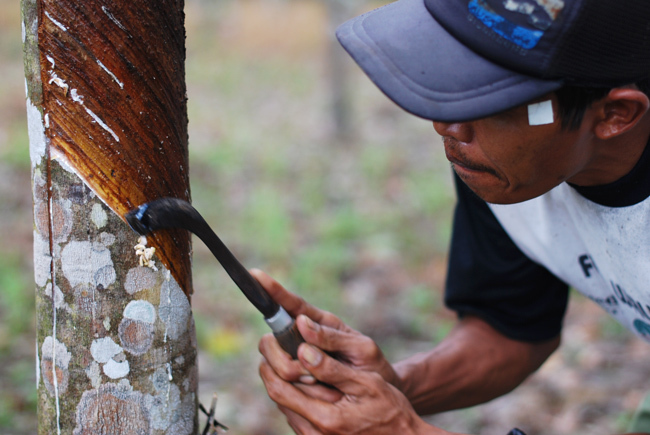 In a rubber field in Tabalong, south Kalimantan, farmer Bahruddin scores a diagonally descending cut into one side of a tree trunk with his black-blade machete. 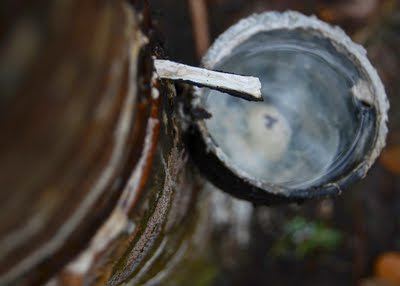 White rubber oozes from the gash, trickling along the wound and dripping into a small plastic bowl hanging from a nail in the tree trunk. "I make one cut into each tree daily," says Bahruddin, running a finger down the guiro-like scores of yesterdays. He scores down one side of the tree only. 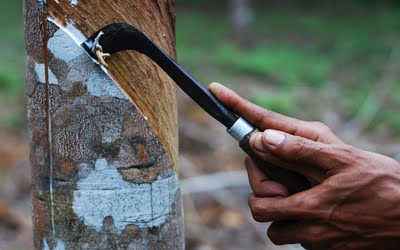 Once the track of cuts on the active side of the tree has reached the base, the tapper will begin working the lee side, allowing the cut side to heal. 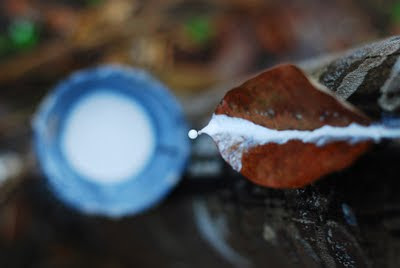 "The rubber is good from a waist-high cut, but can become dirty when taken from a cut close to the base of the tree." It takes between five and seven years for a rubber tree to be ready for harvesting. Snug within a forest clearing is the rubber processing platform of the Kelompok Kebun Karet Unggul: the Best Rubber Garden Group. The farmers tip their bowls of rubber into tin trays with a mix of water and acid. The trays are placed in the sun to set; they look like trays of white school glue. 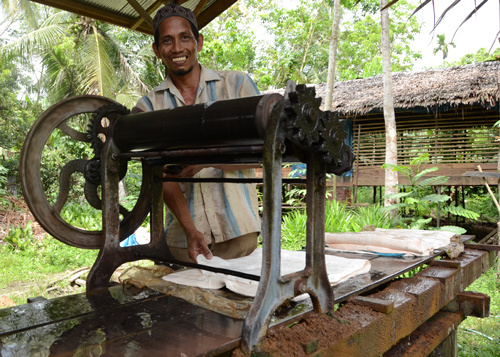 "It takes thirty minutes for the rubber to set," says rubber farmer Rajuli. "Fifteen," counters rubber farmer Junaidi, above. Today they are working together in the processing platform. The processing station is a simple roofed wooden stage with a single work bench bearing two pressing machines and a suspended weighing device. The processing equipment is used jointly by members of the Best Rubber Group, and collectively the farmers process 200 kilos of rubber a day. Each farmer uses rubber produced from his own trees. 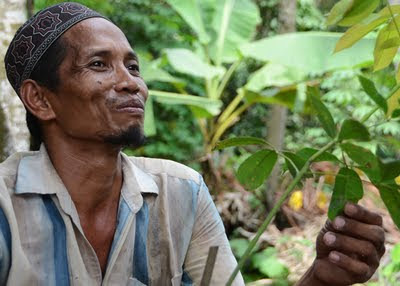 "I've processed thirty kilos today," says Rajuli, who has 1,000 trees over two hectares. Once set, Junaidi tips the jelly-like rubber from its tray onto a flat section of the wooden floorboards. He pats and spreads and flattens the rubber, like a chef with soft dough: teasing the rubber into a rectangular pancake. Junaidi feeds the wet rubber sheets through the two hand-operated pressing machines, squeezing out the excess water. "This second machine scores the rubber with lines, giving it texture." The pressed rubber is weighed and then hung in a wooden smokehouse for three days. 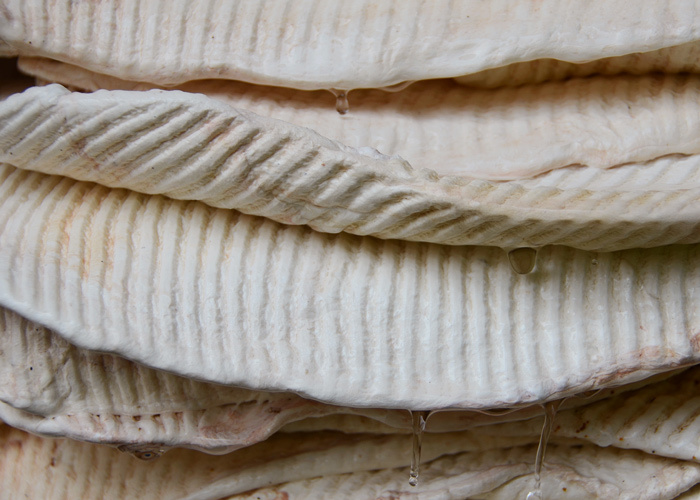 "We turn the rubber sheets twice during the smoking process. If the rubber is yellow, it is under-smoked; when it's ready, it's a deep brown." 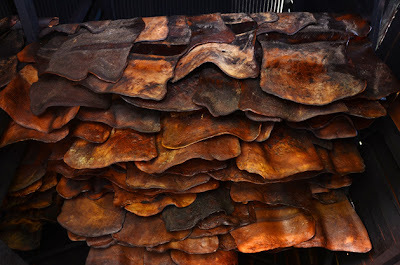 The smoked rubber sheets sell for around Rp 32,000 ($3.50) per kilo in the market; one sheet weighs a kilo. "You really should visit the Tanjung rubber market here," encourages Zainal, a driver for Adaro Energy. "When the rubber quality is high, the market is crowded. You'll see people poking the rubber with their fingers, testing the quality and haggling for the best price. The harder the rubber, the lower the water content." "But it's not open today...". Great job, Melanie.. I like the way it begin. "Poke it. Poke it with your forefinger. ", Although you just quote the conversation. With such arragement, it is tempting to read what you share here, :). Just as you see: collecting local stories and taking photos. It's hard to miss the Adaro folk: their vehicles are everywhere! Are you still in the region?